The Celebrity Reflection is the newest cruise ship in the Solstice class and joined her four older sister ships (Celebrity Solstice, Celebrity Equinox, Celebrity Eclipse and Celebrity Silhouette) in the fall of 2012. Celebrity has kept many of the features found on the other Solstice class ships, but has added a few new ones that cruise travelers will enjoy. Reflection Suite - There is only one of these suites on the Celebrity Reflection, and it's a great one. This two-bedroom suite is over 1,600 square feet and has a 194-square foot balcony. The suite comes equipped with a large dining area, contemporary living room, and a signature bathroom with a glass shower that extends over the edge of the ship. Signature Suites - The ship has five Signature Suites, and they are located in the same private keycard access area as the Reflection Suite on deck 14. The floor-to-ceiling windows in the sitting area provide terrific views, and the 441-square-foot suite has a 118-square-foot veranda and can sleep four guests. AquaClass Suites - These 32 suites were inspired by the popularity of the AquaClass cabins on the other ships. Measuring 300 square feet, the suites are larger than the AquaClass cabins, but still provide all suite amenities and complimentary access to the Blu Restaurant. Celebrity has also added eight more Sky Suites to the Celebrity Reflection, bringing the total to 52. Like the other ships in the Solstice class, the Celebrity Reflection has a diverse selection of other suites and luxury cabins such as the Penthouse Suite, Royal Suite, Celebrity Suite, Family Ocean View, AquaClass, Concierge Class, and Sunset Veranda. The Celebrity Reflection has 30 cabins and suites that are wheelchair accessible. All of these are larger than the same accommodations in the standard category and have large, accessible bathrooms. Those who have dined on the Celebrity Silhouette will find the dining options on the Celebrity Reflection to be almost identical. The cruise ship has a dozen dining venues, ranging from the elegant, romantic Murano with its memorable Continental cuisine to the ultra-casual outdoor Mast Grill. Six of the restaurants have a fixed fee. Each of these is different, interesting, and worth the extra surcharge for a special dinner. Qsine is a fun tasting restaurant, perfect for a group of friends. The outdoor Lawn Club Grill is also a good choice for a group since one member of the party gets to play chef and cook the meal (don't worry, a professional is there to help). The Italian steakhouse Tuscan Grille and Murano are nice for a romantic dinner. The Tuscan Grille has marvelous views over the aft of the ship and Murano is elegant, quiet, and special. The Porch and Bistro on Five have a small surcharge and are a tasty option for lunch or a casual meal. Cafe al Bacio & Gelateria has specialty coffees, teas, pastries, and gelato, all with a la carte pricing. Not all the restaurants on the Celebrity Reflection have an extra fee. The four included-dining-venues are very good, and many passengers are perfectly happy eating in them, saving their extra dollars for drinks, souvenirs, or shore excursions. The main restaurant, the Opus Dining Room, is as striking as its counterparts on the other Solstice-class ships, with a spectacular chandelier and two-story wine tower dominating the room. The Oceanview Cafe buffet has a wide selection of International cuisines, with stations rather than long buffet lines. Although most of the restaurants have healthy choice options, the AquaSpa Cafe in the Solarium specializes in this type of cuisine, featuring light bites for breakfast and lunch. Finally, if guests begin to crave a burger, hot dog, or fries, the Mast Grill is the place to dine. I love the look of the Blu Restaurant, which is only open to those staying in the AquaClass accommodations and to suite guests when space is available. This venue features "clean cuisine" and has an elegant ambiance. The interior of the Celebrity Reflection is classic and contemporary. The furnishings are rich yet comfortable. The Atrium, with its signature tree, is often the first interior common area an embarking passenger sees. This multi-deck atrium stretches from deck 3 to deck 15 and is surrounded by interesting venues, most with quiet seating such as the Library, the Hideaway, and the Celebrity iLounge. Other venues, like Game-On, a new twist on a card room, also are near the Atrium. The Celebrity Reflection has many of the same lounges and bars as her sister ships. There are at least a dozen lounges, including the Sky Observation bar, with its great views by day and disco by night, the outdoor Sunset Bar on the aft of the ship, and Michael's Bar with its large selection of international beers. The Martini Bar, which has an icy top, and the Passport Bar in the Atrium are very popular before and after dinner. Since I love to try different wines, Cellar Master is one of my favorite watering holes. 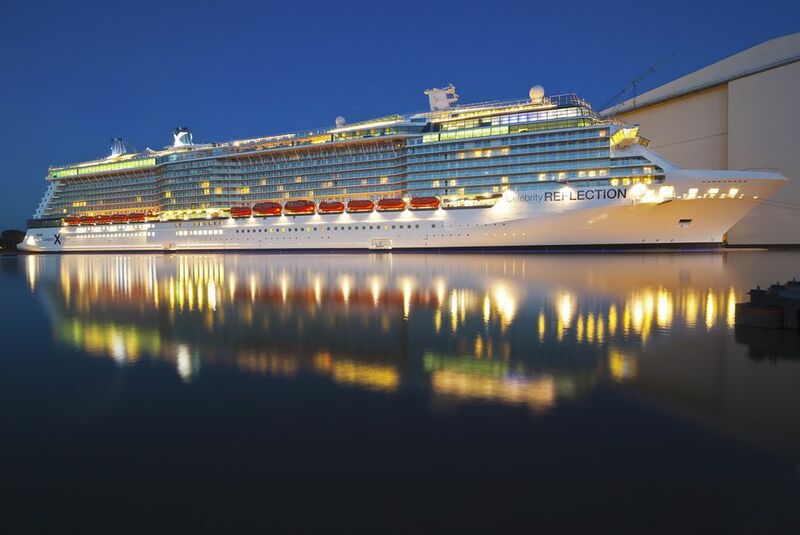 Like most large cruise ships, the Celebrity Reflection has a wide variety of entertainment centers, including a casino, large show lounge, and several venues that feature either live music or disco. In addition, the shopping gallery includes such well-known retail shops as Bulgari and Michael Kors, along with a jewelry shop, women's shop, and men's store. One new space on the Celebrity Reflection is the 2,853-square-foot Conference Center on deck 3, which can accommodate up to 220 guests. This multi-functional space can be used for a wide variety of events such as weddings, banquets, classes, cocktail parties, or business meetings. The space has moveable walls, so the venue can be divided into smaller rooms. It also features four 70-inch LCD televisions. The ship's culinary team can cater all sorts of different types of dinners or parties. The AquaSpa by Elemis has some interesting new treatment rooms, and it also features a full menu of spa treatments. The Persian Garden has been expanded to 883-square-feet and now has a Hammam, Cold Room, sensory showers, and infrared sauna nearby. Adults will love the adults-only Solarium, with its nice pool and relaxing lounge chairs. The outdoor deck areas of the Celebrity Reflection are designed for fun, activity, and relaxation. A large pool and hundreds of deck chairs and sun beds dominate much of the outdoor space. However, like her sister ships in the Solstice class, the signature outdoor area is the Lawn Club. Yes, it's real grass, and I wish my yard at home looked half as good! Those looking for more action can try the basketball court. The number of Alcoves, which are cabana-style retreats on The Lawn Club, has been increased on the Celebrity Reflection. These can accommodate either two or four guests, and a rental fee applies. The Alcoves are fun for relaxation, a la carte picnics and drinks, and even come equipped with WiFi.